VIENTIANE, Laos -- The government will work with the countries whose companies are stakeholders in the Xe-Pian Xe-Namnoy hydropower project to investigate the cause of the collapse of the project’s saddle dam, Prime Minister Thongloun Sisoulith announced yesterday. The 410-megawatt capacity hydro plant is a joint venture between SK Engineering and Construction and Korea Western Power of South Korea, Ratchaburi Electricity Generating Holding PCL of Thailand and Lao Holding State Enterprise of Laos. The collapse of the dam flooded many villages in Sanamxay district, Attapeu province. The remains of 10 people had been located as of yesterday, with more than 100 still declared missing. Thousands more have been left homeless. Thongloun pledged a thorough investigation into the cause of the collapse, saying it would take place in a transparent and just manner. “The government of the Lao PDR will cooperate with the governments of countries whose companies have been registered (as stakeholders) to address this issue,” he said while visiting the Ministry of Labor and Social Welfare to witness the donation of relief supplies. The design, construction contractor and consulting companies will also be investigated, he added. “The government will also look into the responsibilities of the authorities,” the premier told officials and media present at the ministry. All of the investigations will take place in a “transparent and just manner,” the prime minister said. Thongloun told media last week that the newly established National Ad Hoc Committee in charge of dealing with the disaster will work with the project developers to seek common ground concerning the responsibilities and obligations of the party whose actions were deemed to have caused the tragedy. 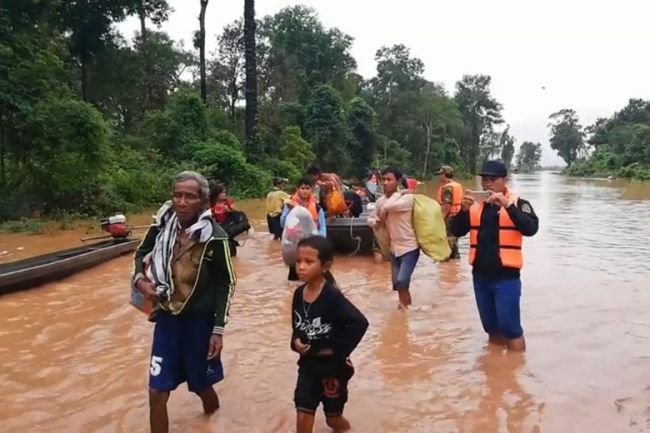 Minister of Energy and Mines Khammany Inthirath told a press conference last week that the company concerned would not be in a position to deny its responsibility for the deadly flood, the biggest to occur in Laos. “Regarding the matter of compensation, I would like to affirm that, based on the concession agreement, all incidents related to the construction of the dam must be borne by the project developer 100 percent,” he said. Thongloun pledged that the government, with support and assistance from all sectors, friendly countries and international organizations, would do its utmost to search for and rescue all those still missing.